How can I adjust the screen brightness and timeout on my Galaxy S5 Neo? You can adjust the brightness of your device's display, or allow the brightness to adjust automatically depending on light levels. You can also adjust the screen timeout—the amount of time it takes your device's display to power down when it's not being used. Note: Turning on automatic brightness can assist with battery conservation. 1. 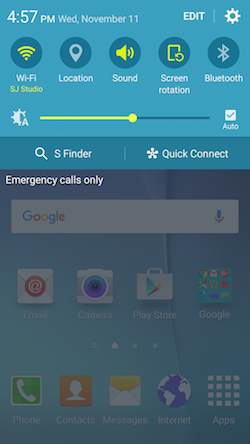 Swipe from the top of the screen to the bottom to open the Notification Panel. 2. 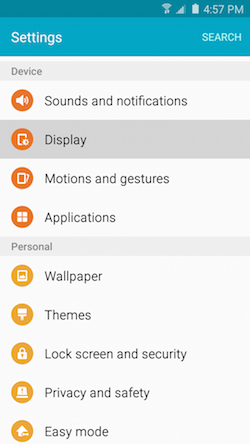 The display brightness adjustment bar is just below the Quick Settings Panel shortcuts. 3. Mark the Auto checkbox to turn on automatic brightness. 4. Move the slider to the right for a brighter screen or to the left for a darker screen. 3. 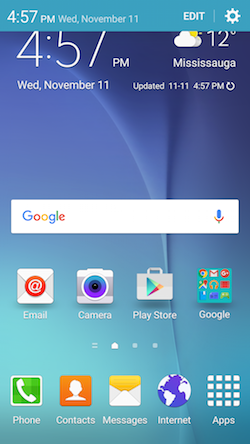 Scroll to and touch Display under the Device tab. 4. Move the Brightness slider to the right for a brighter screen or to the left for a darker screen. 5. 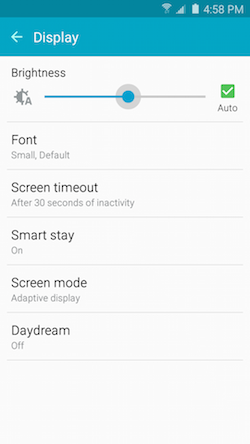 Mark the Auto checkbox to let the device adjust the display brightness based on your environment. 5. 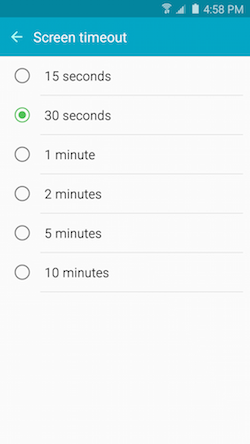 Select the desired delay from 15 seconds of no activity up to 10 minutes.